Very kindly supplied by Señor Sergio Barral of Buenos Aires. 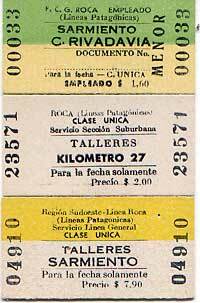 'Clase Unica' replaced the old first and second classes, I believe when the diesel railcars took over from steam hauled passenger services. 'Traf:Gob'; means a passenger on government service, not paying a fare. 'Vuelta - Ida' is equivalent to 'Return - Outward'. 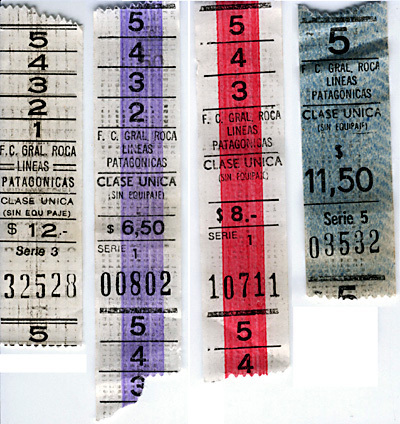 If the ticket is only valid for the day of issue, it is equivalent to a Day Return. 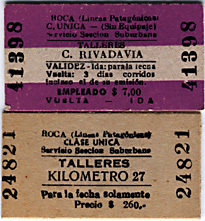 The first two tickets displayed here are specifically for the 'Sección Suburbana'. This stretched out from Comodoro Rivadavia to Astra, Comferpet and Escalante, though cut back to Km. 27 in 1971. Within this area a reduced tariff was in operation, possibly in order to compete against bus competition. 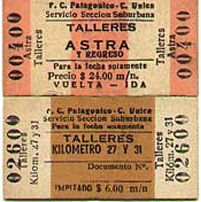 The one immediately above is an employee's 'privilege' ticket, for a return journey between Talleres (The workshops) and Kilometre 27 or 31. 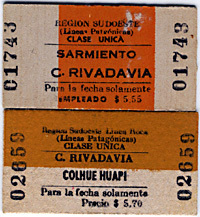 The ticket overprinted 'Estudiante' is a monthly season. Note the year – 1962. 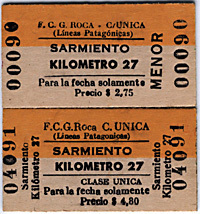 By then the railway was under the supervision of the FC General Roca but unlike the next tickets this one has not been labelled as such. The ticket below is a monthly season. The next one appears to be a schoolchild's free pass. 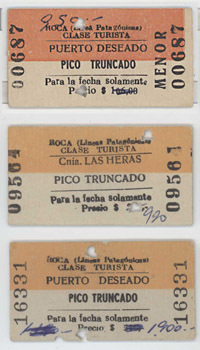 Finally here are a set of paper tickets as issued from a ticket machine carried by the guard on board a coche motor. 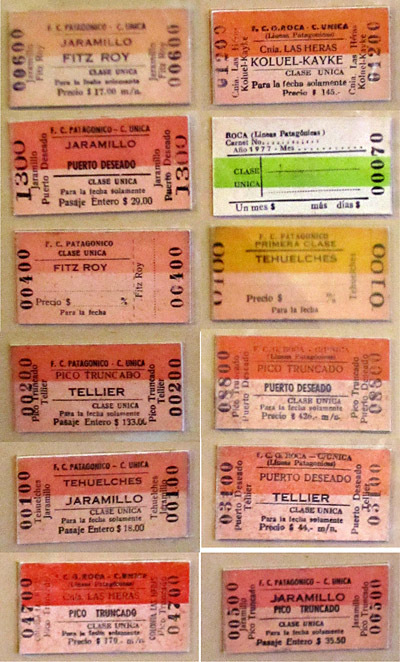 The Museo Ferroportuario in Comodoro Rivadavia has a picture frame which displays a large number of tickets from the railway. These are displayed below, split between four images. No attempt has yet been made to study them. Reproduced by kind permission of the Pto. Deseado station museum.